Monday was a very good day. I wanted to drive at least 500 miles Monday but I did not want to leave real early after a hard weekend and a late night. I did not set an alarm and I woke up after about 6 hours sleep a few minutes before 7:00. I slipped outside and started getting ready to ride. I unloaded the sound equipment from the Green Machine into the BoggsMobile and then loaded Odie's power chair into the Green Machine. I filled up the fresh water tank and then rolled up 100' of water hose. Then I went to work on my tire pressure monitoring system. Several of the sensors needed batteries and I needed to reprogram it for the car tires rather than the trailer tires. I planned on that taking at least an hour because the last time I did it I had lots of trouble. This time it only took about 10 minutes. Wonderful. I did have to top off the air in a couple of car tires but it is quite a bit cooler than it was the last time I added air. It is amazing to me how much difference 30 degrees can make. Here we are at the park just before we left. I cranked the bus a little before 10:00 and then we pulled over to the local truck stop to fill up with diesel. Kelly Jo followed in the Green Machine and we hooked it up after pumping fuel. On occasion I post a picture of the pump when I fill up and it usually prompts quite a reaction. This one gets quite a reaction from me. Because this $404 tank of fuel was a gift. A kind and extremely generous gift! When I went inside the lady said "Sign right here, this one is on JW." JW is Bro. JW from First Assembly. He told me Sunday night that he and his family wanted to fill the BoggsMobile with diesel before we headed out of town. The thoughtfulness of their gift really amazes me. God bless them for being mindful of our daily burden and for helping us to carry it. Thank you, friends. We had a really smooth day with fairly light traffic most of the way. We shot up to Jackson and then stayed on I-20 the rest of the day. We spent the night in the RV parking at the Flying J on the south side of Dallas. We will continue to drive across Texas all of today by God's grace. Thanks for praying for us. 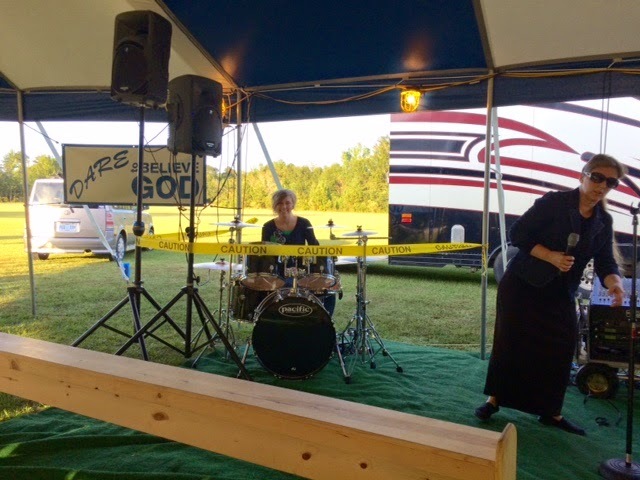 Here are a few pictures from the final night of tent revival in Richton, Mississippi. It was a great night that capped off a tremendous week of revival. Bro. Barry Gautreaux drove over from Pine Prairie, Louisiana to be in service with us. That was a treat! Wow and Wow Again! 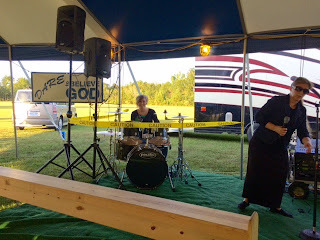 There is no way I can tell you how good Sunday was in Richton, Mississippi. It was nearly unbelievable and I witnessed most of it with my own two eyes. It is hard to process all the good that we saw accomplished. Sunday morning Pastor Scott Morris and his folks nearly preached me to death. God ministered to us all and the altar service was tremendous. I could not imagine it being much better than it was Sunday morning. But Sunday night was even better. God used Bro. Scott in a mighty way. All we had to do was pray, shout and rejoice and we did a lot of that. Many, many folks received help from the Lord during Sunday night's service. 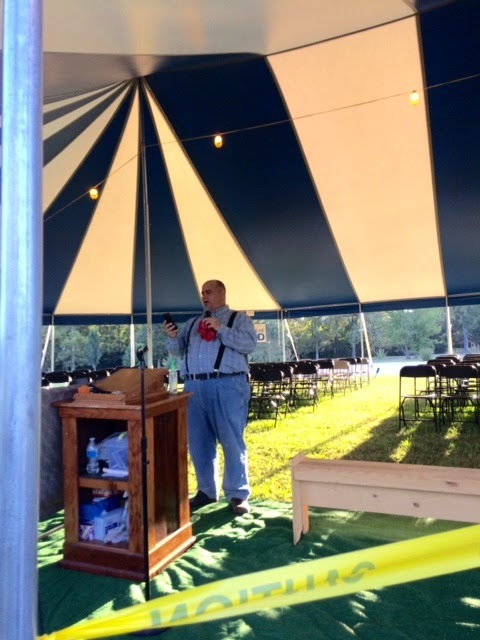 It was a super great way to cap off a tremendous week of tent revival. We have enjoyed being in Richton so much this week. God has used these folks to strengthen our faith and resolve to trust God in all things. We have watched God work in lives and it has been amazing to behold. Praise God for Pastor Scott Morris and his church. The way they have responded to the Spirit of God this week has been wonderful. It is very, very difficult to leave today but we must point the BoggsMobile toward the west. My GPS tells me we are 1604 miles from our next revival at Desert Cove Assembly in El Mirage, Arizona. Kelly Jo and I hope to leave here by mid-morning and put in a very long day of driving. Please pray for us that we have good weather, save driving and no mechanical problems. I did say it would be just me and KJ on the bus this week. Bro. Scott asked Odie to stay with them and bypass those long miles by taking a flight to Arizona on Friday. She found a cheap flight so she is staying here a few days. That should be a relaxing change for her. By God's grace we will meet her on the other end. We did not get many pictures Sunday but here are the few we did take. I hope you had a great Sunday. Thanks for reading. Kelly Jo loaded up in Sis. Kim's car and sitting in a car seat sucking her thumb. She is a nut but she is my nut! Wow! What a wonderful week in Richton, Mississippi! This is our fourth tent revival in the Richton city park with Pastor Scott Morris and First Assembly and I declare I think they keep getting better every year. God blessed in drawing men and women to Himself and saving those that responded. Praise God for His help. We enjoyed every service and hated to see the week come to an end. The weather this week was absolutely perfect for tent revival and that made it even better. The day time temperatures were great and the nights were too. I was sweating every night but I always sweat. I saw a few wrapping up in blankets one night so it must have been just about right. We had heavy dew each night but I do not think it rained one drop on the tent all week. As the week was winding down the weather guessers were calling for rain on Saturday. I was worried some about being able to get the tent down dry but it all worked out. The folks helped packed the chairs and everything away after church Friday night and then a big group came Saturday afternoon and took the tent down. It was down and packed away in 40 minutes. This is one of those rare weeks that our view did not change on Saturday. The tent came down at 1:00 on Saturday but we are still parked right here. We are preaching a few miles way inside the church at First Assembly and it was just easier to stay here for two more nights. We plan to leave here on Monday and begin our 1600 journey to El Mirage, Arizona. Another two nights in the same place will do us good. I will be putting in a lot of time in the drivers seat this week so the posts may be mostly pictures.